I went to yesterday’s Silicon Valley Bike Summit because it was a matter of national security: three months living full time in California - and even longer since I resigned from the Connecticut Bicycle & Pedestrian Advisory Board and Stamford’s bike groups - I’ve been having serious bicycle community involvement withdrawal. The Bike Summit - created and organized by the Silicon Valley Bicycle Coalition - was the good stuff. I shot all the bike nerd data into my bloodstream and immediately knew where my registration fees went. I’ll go next year for sure (this was the SVBC's 5th annual summit) and if you live in the Bay Area and want to make it easier for you and your neighbors to #choosethebike in day to day life, you’ll want to go too. Now if you weren’t in the packed room yesterday at the Oshman Family Jewish Community Center in Palo Alto, here are just a few of the takeaways (you can also look up the hashtag #svbikesummit on Twitter to see some of the highlights or, even easier, look at the Silicon Valley Bicycle Coalition’s story of the summit). 7) The Question: What is Stopping Us From Being The Best Bicycle Place in the World? During one of the panels this question was asked. It’s the best thirteen words spoken about cycling since the original Thirteen Words I always wished politicians would say. It’s a good starting place for any community and a helpful way to get to the bottom of why people won’t #choosethebike. Vision Zero is about redesigning and remaking cities to eliminate deaths on roads and educating citizens on the move to make that vision possible. SVBC made a useful kit of data and recommendations to help get any city or town moving on their own Vision Zero plan. The link to the SVBC Vision Zero Toolkit is here and it must be put in front of every Bay Area leader’s eyes - except not when they’re driving. That’s just dangerous. Also be sure to read the acknowledgements page from start to finish because a lot of great work from a lot of different sources went into this. …but nobody has all the money they want to change every road they have. Data measures (‘What gets measured gets done’ was another great line from the summit). Data creates urgency. Data can show the effects of certain pro-bike efforts and help guide funds to priority areas. For instance, one of the most teeth-gnashing figures from yesterday is that El Camino Real makes up about 1% of San Mateo County roads but is responsible for 14% of bike collisions. Sounds like a serious candidate for improvement. The Santa Clara County Public Health Department's Bicycle Transportation & Safety in Santa Clara County report was available to the Bike Summit participants. The link is here and just like with the Vision Zero Tool kit please read the acknowledgements page because this kind of data doesn’t fall from the sky. The SCCPHD report’s content can vary from geekilicious to terrifying. If you’ve ever wanted to know who rides in general, who bikes to school, where your town ranks in terms of bicycle commuters* this is your report. If you want to look at trend information about bicycle injuries, what factors are involved and how frequently bicyclists are considered at fault, read the report. Actually: I take that back. Read the report whether you want to or not. It’s that important. Now it’s one thing to have useful data but it’s a tree falling in the woods with nobody around to hear it if no one wields it in public. Time and again panelists and audience members stated that town hall meetings must be packed, letters to the editor must be written and cyclists. Period. Must. Period. Vote. Period. So if you live in Silicon Valley and want to get involved with local issues visit the SVBC calendar page and go to your nearest event and go to town meetings. Data is your sword and town halls are the caves that may or may not have dragons in them. Go forth. I’ve been to conferences all over the world and can credibly confirm that the ones without neckties are the best places to meet people. I met the head of Cyclelicious on the group bike ride to the event. I met great folks at my table (including the bike blogger LadyFleur). I had a nice lunch with a city planner I met in line for sandwiches. I learned about the Silicon Valley Bicycle Exchange while waiting for the first panel to start. I even got to meet someone because I sent the following image as a tweet during the summit. I also got to meet a guy from GenZe, the company that provided the electric assist e-bike for the happy hour raffle. It was hard to imagine a more fun place to network. Also: all these good looking people walking around there must have been at least one meet-cute. 2) The Phrase ’The Great Thing About Bike Share…’ became the ‘This One Time At Band Camp…’ of The Summit. You had to be there. But because you weren’t you can follow Frank Hebbert, the Director of Digital Product Management at Motivate, on Twitter. You can also give a read of my white paper on the London Bike Share I did last year. Wisely, SVBC assigned all of the attendees a number which decided which afternoon breakout session you’d be involved in. Working with the Engineering group was an interesting exercise: we were all asked to think about what behavior cyclists do that we don’t like to see as motorists and then we were asked to put on the more familiar hat and discuss what driver behaviors we don’t like to see as cyclists. Afterward, we melded the two lists and tried to discuss how to engineer streets to change both behaviors. One of the solutions that would enable better behavior were various ‘road dieting’ initiatives, such as making driving lanes narrow - so cars would drive slower - and using the space left over to make a bike lane, which would not only give bicycle users a safer place to ride but also encourage cyclists not weave in and out of traffic. When you reduce a driver’s lane from 12’ to 10’ the motorists won’t notice - but the bicycle commuters will. So those are some of my takeaways. I thank the Silicon Valley Bicycle Coalition for creating this event and I urge you to read those reports and decide what action you want to take to make cycling better where you live. That’s what it’s all about. Thanks for reading and thanks for riding. I love your toy car diagrams! 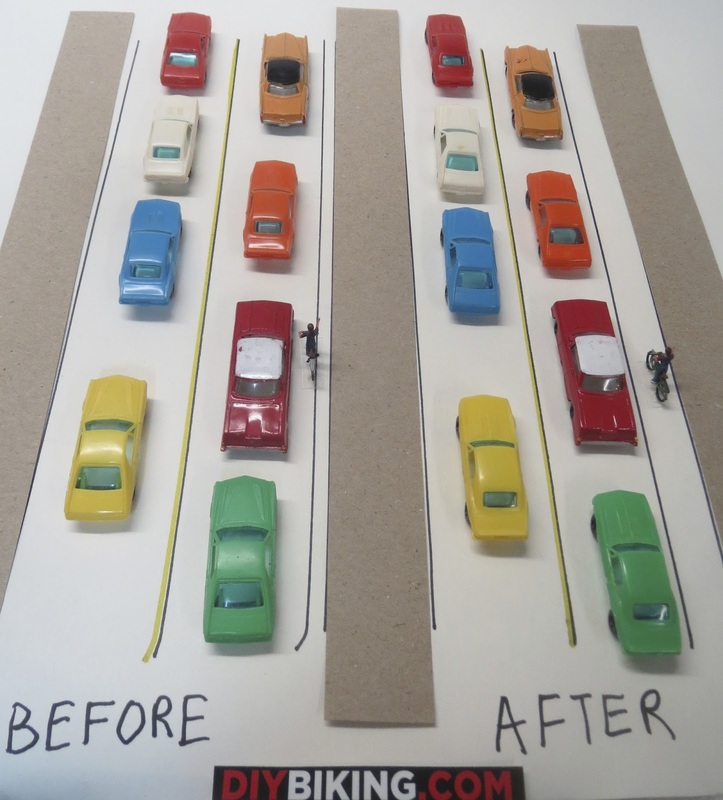 What Do Bike Lanes Do To Car Traffic?